Toilet seats are one of those things we don’t appreciate enough until they are broken. Aside from being a must-have bathroom accessory, the best toilet seat add a lot to the overall look and décor of the toilet. We have compiled a list of the best 10 toilet seats on the market that will not only make you feel comfortable but add a splash of elegance to your bathroom as well. How To Choose a Toilet Seat? Will any toilet seat fit my toilet? Do I need all those extra features like soft-close and whatnot? Should I consider plastic or a wood as the toilet seat material? How practical are quick-release hinges? Should I look for an easy to clean toilet seat? These are the no-nonsense, no-frills toilet parts found with most flush toilets suitable for regular plumbing. These do not have any special mechanism, just the regular hinges that set the seat on the bowl. This newer fixture provides a soft close mechanism added to the hinge to reduce the noise, as well as to prevent the seat from banging against the toilet bowl too hard. The regular high-impact plastic found in most toilet seats. The sturdiest toilet seat made out of high quality, a high-density polymer that lasts longer and has a premium look and feels to it. A less conventional option, wooden toilet seats can change the entire décor of a bathroom for the better. So, which is a good quality toilet seat to buy? The KOHLER K-4639-0 Cachet Quiet-Close with Grip-Tight Bumpers Round-front Toilet Seat is a good place to start. It combines the sleekness of Kohler with convenient technologies like its patented Quiet-Close to give you a pleasant experience. There are also features like added grip, quick-release, and matching hinges packed into this seat. For more traditional toilet seats, our pick is the American Standard 5311.012.020 Laurel Elongated Toilet Seat. It comes in a high-gloss design and features a wood seat that goes well with most bathrooms. There are hard-fastened bolts that hold the seat in its place, as well as twin valves for easy cleaning. While looking for a good toilet seat, the first thing to take into consideration is the shape of your toilet. There are two basic shapes – round and elongated, or oval. Check the shape carefully, and buy your seat accordingly. Toilet seats come in two mount styles – integral or conventional bolt-and-nut. Integral ones last longer, but since they are drilled stuck on the toilet, they can be very difficult to replace. Conventional ones, on the other hand, are easy to replace but do not last that long. The popular standard for the toilet seats is high-impact plastic. The sturdiest toilet seat in today’s market is usually made from this. However, you can also pick a less conventional toilet seat material like wood or foam based on your need and taste. While most toilet seats come in a barebones fashion, you can opt for padding if you like a bit comfort while on the toilet. Padding can also be useful for elderly people, as well as people with certain disabilities. Toilet seats are some of the last things that come to mind when you think style. But in reality, there are hundreds of seat cover styles available in the market for toilet seats. You can choose any style, ranging from traditional to modern and sleek. Alongside style, color is another major thing to consider for the toilet seats. Its color should match your toilet, as well as the rest of the bathroom accessories. Are you looking for a toilet seat for your master bathroom, the spare one, or for your kids? Your choice of style and color should vary according to the location of the toilet. Aside from the regular toilet seat features, you can get extra ones like illuminated seat with a nightlight, auto close, heated toilet seat, remote control, deodorizer, warm water, touchless, sprayer, air dryer, and so on if you are willing to spend a few extra bucks on your new toilet seat. You can also get special purpose toilet seats, such as ones for potty training or for elderly people if you need to. These fall into the category of the best-padded toilet seat to buy. Let’s face it – the biggest reason people use a toilet seat is for comfort. Who wants to hurt their bottoms while seating on the toilet, right? The toilet seats help maintain the hygienic nature of the bathroom. They are sanitary, easy clean and remove, and give you a sense of cleanliness all around. As mentioned before, specially designed toilet seats for the elderly and children can help with health issues on the toilet. And last, but not least, the toilet seats add to the aesthetics of a toilet, along with the overall décor of the bathroom. Not necessarily. Toilet seats are basically of two shapes – round and elongated. Before buying one, make sure it is compatible with the size of your toilet. For most people, a regular toilet seat will do the trick. And they are pretty cheap too. But if you’re ready to shell the extra bucks, you can definitely go for added features. Plastic seats usually last longer and are easier to clean, but wooden ones look classier. The choice is yours. Although features like quick-release hinged seats and toilet seat covers may seem redundant to some, they do come in handy, especially while cleaning your toilet seat. Why not! At least you won’t have to go through the hassle of fighting it out with your brushes and brooms, right? If you’re looking for a silent-closing toilet seat, then look no further than the Mayfair 48SLOWA 000/848SLOWA 000 Slow-Close Molded Wood Toilet Seat. No more finger pinching or hard slamming – close your toilet seat with just a tap. And to top it off, this Mayfair seat comes with a high-end, glossy finish that gives you a classy décor. It’s hard to beat a Kohler toilet when you’re looking for bathroom appliances, and the KOHLER K-4694-0 Ridgewood is no different. It is an elegant toilet seat that looks and feels every bit of the price, and then some. Made out of compressed and molded wood, the KOHLER K-4694-0 Ridgewood in white will add a touch of class to your bathroom décor. On the side of functionality, it is compatible with the elongated design, and will fir both one-piece toilet, or two-piece ones. Another great toilet seat from Kohler, the K-4695-0 Ridgewood Molded-Wood is an elegant statement from its Ridgewood line of seats. It is a round-shaped seat that will add a splash of class to your bathroom with its white body and matching hinges. Like other Ridgewood models, it fits both one as well as two-piece toilets. The biggest complaint against toilet seats is that they are notoriously hard to clean. Well, with the Bemis 500EC000 Molded Wood Round Toilet Seat, cleaning toilet seats is super easy. You can take a damp cloth and some mild detergent, and voila! Your seat is clean as new. 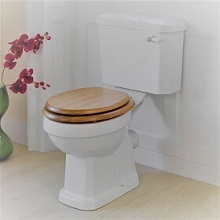 The Bemis 1500EC000 Molded Wood Elongated Toilet Seat is Bemis’ solution to elongated toilet bowls as it comes with the same trusted quality that the manufacturer is reputed for. Easy cleanse, twist hinges, and a silky white design – what’s there not to love? Another great toilet seat from Bemis, the 800EC000 Plastic Round Toilet Seat holds up the company’s legacy by proving to be yet another solid product. If you do not mind the price, you’ll love how easy it is to install and keep clean. And the glossy finish is just the cherry on top. If you’re looking for something a bit more heavy-duty than your everyday toilet seat, then the 7800TDG000 Plastic Toilet Seat from Bemis is your pick. It is a durable seat that is every bit as fashionable and elegant as most other artsy seats out there. And it fits all elongated bowl designs too! The 5311.012.020 Laurel Elongated Toilet Seat from American Standard is a high-gloss affair that comes with all the elegance of a wood seat. Its elongated laurel design is both practical and pleasing to the eye. To top it off, it comes with two-faced washers that are adhesive as well. The AquaSense Portable Raised Toilet Seat comes with a unique design. This raised seat adds an extra 4 inches to your toilet seat, keeping especially people with physical conditions in mind. Despite being somewhat of a niche toilet seat, it ticks all the boxes for a regular seat, and then some. It is very lightweight, portable, and made out of durable plastic. If you’re looking for a toilet seat that combines the sleek look of Kohler seats with latest technologies like soft-close, then the KOHLER K-4639-0 Cachet Quiet-Close with Grip-Tight Bumpers Round-front Toilet Seat is just the seat for you. It features a soft-closing lid, bumpers with added grip, and a quick-release option for easy removal and cleaning. So, which is the best-rated toilet seat to buy? For our recommendation for the best toilet seats, we choose the KOHLER K-4639-0 Cachet Quiet-Close with Grip-Tight Bumpers Round-front Toilet Seat as it comes in an elegant mix of style and class. With Kohler’s sleekness and features like whisper-close and added grips, it is hard to say no to this seat. From a more traditional approach in the toilet seats, we love the American Standard 5311.012.020 Laurel Elongated Toilet Seat. It is simple yet stylish, and packs a lot of features like twin washers and fastening bolts to make it an ideal choice for your toilet.